5000 hand-crafted wooden CD boxes have been designed by Carve, a Dublin based company. The boxes are numbered and were created using off-cuts of wood, that would have otherwise ended up in the scrap heap. They are finished with a special resin mix and natural beeswax, while being very careful to retain the raw beauty of the wood. The box contains the CD and four individual cards that are printed with artwork and lyrics. Each box also comes with a digital album plus the bonus track ‘camarillas’ delivered on album release. 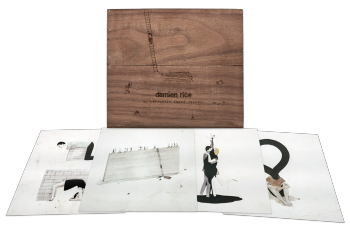 The wooden CD boxes, standard CD, 180g double vinyl and limited edition lithograph are all available through damienrice.com.